We've only seen one V12 Engine Of The Day so far? Unacceptable! Let's take a look at an engine that you Project Car Hell masochists should have no problem obtaining cheap at the junkyard! It used to be that the only cheap V12 you could find for your Hell Project was the good ol' Jaguar unit. 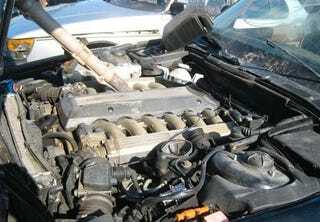 Sure, that's just the ticket for a moderate power upgrade to your Austin-Healey 100, but now the cheap self-service junkyards are filling up with BMW E32s, as owners realize that there's no such thing as a cheap or minor repair for a top-of-the-line 7 series. The North America-market M70 put out 322 horsepower and 361 foot-pounds of torque in the '97 750iL and 850Ci, and it did it with such smoothness that even the most sensitive Ponzi-scheme mastermind wouldn't be irritated.